The 8th-century Chinese poet Wang Changling first proposed that every poem had Yi Jing (thought place), an invisible landscape created in the reader's mind. Likewise, pictures can evoke mental landscapes seen only in the mind of the viewer. For over two decades, photographer Tim Wong and calligrapher Akiko Hirano have been creating mental landscapes through their collaborative work. In this project, the scene begins in a temple high on a misty Japanese mountain, where a calligrapher quietly grinds ink on an ink stone. As she begins to write, her mind takes the form of a shrouded figure traveling through time to an alien land of the Anasazi Southwest. 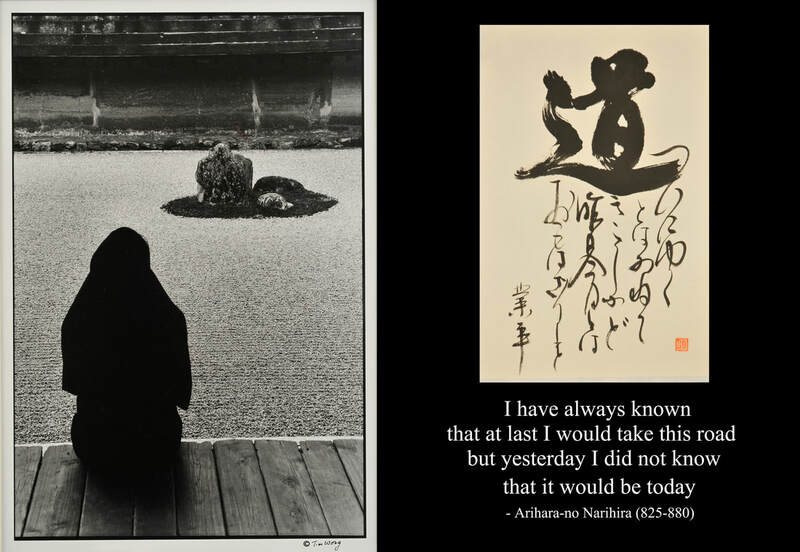 The journey is told with black-and-white photographs complemented with prose and poems in Japanese calligraphy. Wong and Hirano were scientists and faculty members in University of Washington in Seattle before quitting their positions in 2000 and moving to Santa Fe to open Touching Stone Gallery, which brought understated Japanese aesthetic to Santa Fe for 14 years. They retired in 2014 from the gallery to make time for their own art. Wong studied traditional black-and-white photography in the Photographic Center Northwest in Seattle. His work has been exhibited in Seattle and Santa Fe. Hirano practiced Japanese calligraphy since she was 6. Her work has received recognition including a commission by the New Mexico Museum of International Folk Art for the Japanese title banner for the 2006 exhibition 'Fifty Centuries of Japanese Ceramics from the Montgomery Collection'. As scientists and scholars of Japanese aesthetic, Wong and Hirano have collaborated on more than 50 publications in science journals and art magazines.